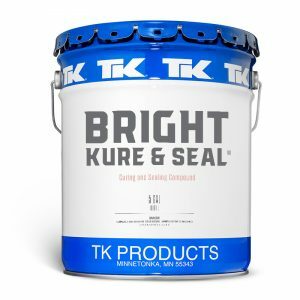 DOT Approved Concrete Cure and Seal 26% Solids – Bright Kure & Seal™ TK Product’s Bright Kure & Seal is a 100% Acrylic concrete cure and seal that is 26% solids. Formulated in a gloss or matte finish, TK’s cure and seal has been approved by the Department of Transportation (DOT) in the use of curing decorative concrete surfaces in some states. Bright Kure & Seal can be used in interior and exterior on both freshly poured concrete as well as existing concrete surfaces for ultimate protection.